The Mormon mission purchased approximately 6,000-acres of land in Lāʻie in 1865; at the time, sugar production was growing in scale; in addition to farming for food for the mission, the Lāʻie land was considered to have a good potential for growing sugar cane. In 1867, the first sugar cane was planted and was later expanded with the Lāʻie Plantation. Sugar provided the positive economic impact and gave financial support to the Mormon Church in Hawaiʻi. However, in the 1920s, the plantation had financial problems and the Church later leased sugar lands to Kahuku Plantation Company. Then, in 1955, the Mormons started the “Church College of Hawaiʻi” (CCH) in Lāʻie (in 1974, the school changed its name to Brigham Young University-Hawaiʻi Campus (BYU-Hawaiʻi.) Church officials looked for ways to provide jobs for the growing student population. The success of the hukilau and the diversity and number of Polynesian students at the College led to expanded entertainment, including free tram rides to the nearby temple grounds. In 1959 students and faculty at the Church College of Hawaiʻi organized the “Polynesian Institute” (later renamed “Polynesian Panorama”) and took the show on the road. CCH students performed first at the International Market Place, then put on larger performances in the Kaiser Hawaiian Dome in Waikīkī. The Polynesian Cultural Center (PCC) was born. Over 100 “labor missionaries” volunteered to help build the Polynesian Cultural Center’s original 39 structures on a 12-acre site that had previously been planted in taro. Skilled artisans and original materials from the South Pacific were imported to ensure the authenticity of the village houses. Since opening, over 33-million visitors have been introduced to the Polynesian people, their arts and customs, and nearly 15,000-BYU-Hawaiʻi students have helped finance their educational objectives while working as the friendly guides, performers and other PCC employees serving people from all over the world. Each of the major Polynesian cultures has its own section, centered on a traditional village. Hourly performances and cultural learning experiences take place in these villages. Villages include: Hawaii, Samoa, Aotearoa (present-day New Zealand,) Fiji, Tahiti, Tonga and the Marquesas Islands. In addition to the villages, the PCC has a special exhibit dedicated to Rapa Nui (Easter Island or Isla de Pascua) and a tribute to the 1850s LDS mission. Over the years, the program and PCC footprint expanded. An amphitheater built in 1975 now seats almost 2,800 guests. A 1,000-seat restaurant opened in 1979, and IMAX films, shopping plaza and other features were added. 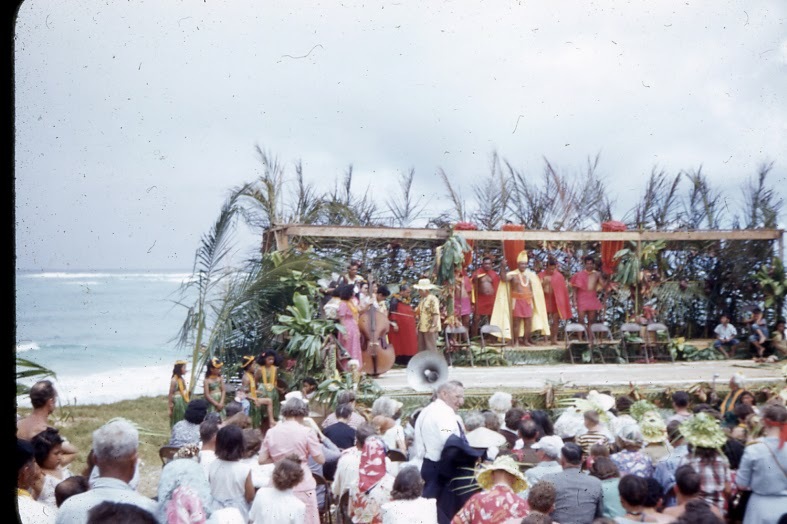 The image shows some of the entertainment at Hukilau Beach, Lāʻie in 1949 (BruceBean) – forerunner to the eventual Polynesian Cultural Center. In addition, I have included other related images in a folder of like name in the Photos section on my Facebook and Google+ pages.